Thank You for your interest in Amerifun! Where are you located/ Do you have a Banquet Facility/ Party Venue? Is a Casino Party Legal/ What is a Fantasy Casino? I did not see what I wanted on your Web Site, what should I do? What are your hours/ What is the Best Time to contact you? You can reach us by phone Mon-Fri 9am-5pm. Weekend by appointment as most events take place on weekends. 24 hour Message Service. If your call is urgent, please send us an email, email monitored 24 hours. You can also use our Quick Quote Page. Email. Where are you located? In order to maintain low overhead and keep our rates low, we do not have a public showroom. We lease a commercial building for our equipment and you can view in person by appointment. Do you have a Banquet Facility/ Party Venue? We have always came to YOU since 1997! Wherever your event is, chances are we are familiar with the facility - and will work hand-in-hand with your facility contact on logistics - so you don't have to! Please visit our Venues page for some great venue ideas. Do you have References? YES. This is normally not public information. We do have nearly 1000 clients in the region and can provide you with numerous references if you desire. Please Contact Us. How much Notice do you need? The sooner the better for best availability. We essentially operate on a first come, first served policy in order to be fair to all. We do however keep you up to date if another client is interested in your tentative date and will go above and beyond to accommodate everyone. We will offer the first client the courtesy of first refusal on a tentative basis without any written contracts from another. In order to guarantee your date we require a minimum 20% deposit, your event date is not guaranteed until deposit is received. What is the Cost? We do offer a premium service, but our low rates are much less that our comparable competitors. Our rates are clearly posted on our site for most items or we can send you an itemized straight-forward quote. We accept Cash (2% discount available for Cash payments). Personal Check (Subject to verification). Company Check or Official Check. We typically do not offer credit accounts. All payments are due at the commencement of the said event. On occasion we may extend credit for certain products or services added to an order. Accounts not paid in full 30 days after invoice will be assessed a late fee of 1.5%. This fee is assessed on the total account balance due. Our games are priced with or without dealer. Consider ordering some games with dealer (such as craps and roulette) while providing your own dealers for other games. Also consider all games without dealer. We will assist you in coordinating your casino and orientating your dealers. Discounts are also available to 501c3 charities, schools and certain non-profits. Please Contact Us for more information. If budget is a concern we may also have economy versions available. Economy casino equipment here. Duration Note: We have a 3-hour minimum and as a general rule do not offer discounts for shorter gaming sessions; most of the labor is involved with getting the equipment onsite and coordinating the staff. Do you require a Down Payment, is it Refundable? In order to guarantee your event date, and if your event is at least 180 days away, we require a minimum 20% down payment and a signed contract. If your event is sooner than 180 days away a larger amount may be required. Note to clients outside of Wichita, KS: We typically require a 50% or more down payment from clients outside of our home city. This is to cover preliminary costs associated with any arrangements that need to be made in advance of your date. You will be notified of all amounts due during the proposal process. Unfortunately we cannot refund a down payment in the event of a cancellation as we may have turned away a potential client that was interested in your date or we may have incurred expense in preparation for your event. In addition there will be an additional cancellation fee greater than your down payment if your cancellation date is closer to the date of your event than 180 days. In the event of an emergency, you may re-schedule your event with an applied credit towards your new event date. Your new rescheduled date must be no more that Six Months from the date of cancellation. Do you require a Security Deposit, is it Refundable? We do not require a security deposit for our fantasy casino or game shows. Most services do not require a security deposit but some rentals may indeed require a security deposit. These requirements are levied by the actual vendor providing the product and not Amerifun. You will be notified during the proposal process of any security deposit that is required in relation to a particular service. Anytime a security deposit is required it will be refunded when all terms and conditions of the contract have been met by the client or all items are returned undamaged. If the client should need to cancel their event the security deposit will be refunded less any past due amounts that have become due to the lessor. What is your Cancellation Policy? If unforeseen circumstances cause you to cancel, please allow us to re-schedule your event in order to keep your deposit and not have to cancel your order. The new event date must only be no more than Six Months from the date of cancellation. A cancellation fee may apply depending on how close it is to the date of your event. Please see your contract for cancellation fee schedule. Can I add or subtract games after the contract is signed? Unfortunately we cannot offer a client the ability to subtract items as we could have offered the item to another client, additionally we may have scheduled vendors that may have reserved items for you. We would be more than happy to increase your order anytime if availability permits. If all requested equipment will fit inside a STANDARD CARGO VAN, we charge a flat $50 delivery fee that is added to the entire order. For larger events in which a 15' BOX TRUCK is needed, the delivery is $75. For very large events in which a 25' BOX TRUCK is needed, the delivery fee is $100. For more massive events in which a TRACTOR TRAILER is required, a $200 delivery fee will be incurred. We feel that our extra delivery fees are indeed fair, especially since some party rental or catering companies charge over $100 for standard delivery and go up from there. Any additional delivery fees are simply to offset fuel and vehicle maintenance costs. Most of the events that we do typically fit inside a van or smaller box truck. Your delivery fee may be higher with supplementary services or depending on the policies of any vendors that we may contract portions of your event with or your venue's delivery restrictions. You will be informed of all costs well in advance. Your final proposal will be an all-inclusive itemized breakdown. An additional labor fee would apply for deliveries to venues with stairs leading to the facility or the banquet rooms if there is not a freight elevator (see next category). An additional labor fee would apply to the presence of banquet tables, chairs or equipment not related to the games that need to be moved by Amerifun staff (in order to clear the banquet space) in the amount of $50 in conjunction with a $50 fee for each additional hour of labor. An additional fee may also apply if your venue presents logistical hurdles such as exceptionally difficult access to a party area. What if my event is Downstairs or Upstairs? The typical fee for non roll-in access is $25 per Level I Game (Blackjack and most others), $50 per Level II Game (6' Games) and $100 for Level III Games (8' Games). Additional charges may apply to additional services or services from outside vendors. If there is a freight elevator that can accommodate our equipment, no extra charge will be incurred. What if my venue places restrictions on Set-up Times? Only a handful of facilities restrict our access to specified times. We will do our best to meet your venue's requirements. Please inform your venue contact that we need a set-up time of a minimum of eight hours before the event start time or the night before. Depending on the event load for a particular date, it may difficult to place all equipment and return to a venue for your event if the set-up or delivery times are too close to the event start time. The logistical fee for set-up times that are closer to the event start time than eight hours is a minimum of $100. The logistical fee is greater than $100 for set-up times closer than four hours to the event start time. † We consider Wichita as 'Wichita and the surrounding area'. There are no additional mileage charges for Haysville, Derby, Andover, Goddard or Park City, KS. Do your charge Travel Expenses? If your event requires members of our staff to travel, we will have to charge travel expenses for the required staff. We only wish to cover the expenses of leaving our home city for all staff members. As mentioned, we will always offer staffing alternatives. An example would be the use of an employment agency (we currently use Adecco, Staffmark or comparable for outside Wichita events). You will not be charged travel or mileage for staffing that we provide locally from local sources in any city but normal cargo mileage charges will apply. We must compensate our staff members for their travel time (our staff member's normal wages are paid from the cost of the game dealers that you order). In order to increase incentive, guarantee enthusiasm and obtain you the absolute best people: we generally compensate our staff $10 per hour for "windshield" time (riding time/ road time) and $15 per hour for the driver's driving time. For example: If your event is a 5 hour drive from Wichita, KS, then we will compensate each staff member for 10 hours as well as the driver. If overnight stay required: We require one average to above average overnight accommodation per staff member, or team of two staff members (we will always make an extended effort to schedule teams of two - this will eliminate excessive hotel rooms). If your venue is a hotel, accommodations at that hotel are required. We may require ONE SUITE or ONE MEETING ROOM per trip to use as meeting space, but only if your event requires more than 5 dealers. Note: If we are only delivering equipment and not staff members, only normal mileage rates for the cargo truck apply (as well as road time for the driver and labor personnel as applicable). Can you explain your Party Planning/ Contract Process? We will first collect your interests via a face to face meeting, by telephone, email or through our quick quote form. We will then send you a complete breakdown of costs for all services (you can still pick and choose at this point) in the form of an Estimate, or Quote (click here or here for some great examples). Following your approval, we will send you a formal Invoice and a Contract. What Games should I order, how many? We have learned through hands-on experience how to determine the optimum number of player positions and what games to recommend for your event. Over the last decade we have tried it all, and have learned from experience what games and how many work best with what number of guests. Our formula works so well that many of our competitors copy us verbatim. NEW Problem ;-) : It is always good to have a positive dilemma! We have run into a new issue with the addition of such a large variety of games, what games to recommend! We offer so many great games that it is hard to make a recommendation. No other company has this problem since they do not have very many games. What we have been doing to address this lately is following our typical guidelines and then leaving a spot open on your quote for substitutions while listing all games available in a particular price category. How does a Casino Party work? In a nutshell: You will receive pre-printed 'vouchers' in advance (equal to your number of guests) to effortlessly distribute funds to your guests. Your guests will make a stop by our cashier to receive their initial Fun Money funds from our tellers (provided at no cost if you order all games with dealer). 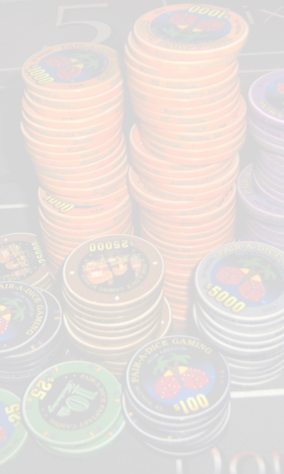 Players will then proceed to the game of their choice and buy chips from their dealer, just like in the casino, or they can hold their funny money for later prize opportunities. At the end of the gaming session (our casino gaming sessions are 3 Hours or less - we have a 3 hour minimum), players will 'cash out' with their dealer or the cashier/ teller for their prize opportunities (we offer players numerous places to 'cash out' so that there will be no inconvenient long lines). What is the duration of a casino party? Our casino events run for three solid hours of playing time. Optional longer times are available by request and may also require additional staffing. Aside from the 3-hour duration, we begin funds distribution early and include prize time afterwards. Additionally we begin tear-down after your guests clear out as not to disturb the end of your event. Is a Casino Party Legal/ What is a Fantasy Casino? Yes, as long as there is no gambling. We remove the "consideration" (the aspect of gambling when players must pay money to play) in that everyone receives a stack of funny money with no cash investment to play for prizes that you provide. Please see our Charity Fundraisers page for information on fundraisers. If your event is at a public venue such as a club, players can buy-in with cash to "try their luck" (like a game of pool) but cannot win any prize. Do you provide Play Money? Yes. We provide plentiful attractive black&white Fun Money on colored paper for your guests in $50, $100, $1,000, $5,000 and $25,000 denominations. We also offer Custom Funny Money. Do you provide Prizes? We can provide your prizes if you wish for us to shop for and deliver your prizes to your venue, this is an optional service. How do I Give Away my prizes? We offer one free prize method (select from an Auction, Raffle, Gift Shop and Giveaway). If we do not participate in the live facilitation of your prizes, we DO still provide all the tools. Live prize facilitation is available as an optional service. Live prize facilitation ranges from less than $1 per person (sound is required). For more information see Prize Methods. Bonus: Free Prize Facilitation always included with a DJ, Emcee, Master of Ceremonies, Host or Game Show order for any sized group. Also consider a Master of Ceremonies. Do you provide a Pit Boss? Yes, free Pit Boss included, we provide ample staffing for all aspects of your casino! Our pit boss facilitates additional winning opportunities throughout the evening. We also offer many optional services involving Live Performers. Please see our Master of Ceremonies for an all-around group service in all capacities. Also see Concierge and Host. Pit Boss is included free within Wichita and surrounding areas. For outside of Wichita events, we will add a Pit Boss to the number of optional required staff members on your quote. Do you provide Tellers/ Cashiers? Yes. Just like with the pit boss, we include all the staffing. Within Wichita, tellers are included free. For events outside of Wichita, we will add the appropriate amount of tellers to the number of dealers required on your quote. Cashier Carts are always free! Do you provide Slot Attendants? Yes. As with pit boss and tellers, slot attendants are included for events within Wichita, KS. Are your Dealers/ Staff experienced, how are they Dressed? Our staff is drawn from a pool of over 200 vendors, employees and independent contractors and are always event-tested. For in-house casino staff, our formal dress consists of black tux shirts, tie, cummerbund or apron- with ID. Our casual shirts are black or blue polo-style shirts with logo. Every games dealer is cultured to casino rules AND fun rules and are trained to entertain! All of our dealers have been with us at least one year and know their game. Trust in our enthusiastic staff members to be lively, interactive and attentive. Do you offer Games WITHOUT Dealers? By all means, this is a great way to really save money! Games are presented walk-up ready for your staff and incorporated into your casino. Simple training and orientation is also included for your dealers. Do you offer Training for our own Dealers? Yes. We include Simple Training and Orientation. Simple training is approached from the standpoint that your dealers have a basic understanding of the game. Written copies of "how to deal" rules are also provided to you well in advance of your event date. We will briefly go over ALL the rules in person with your dealers table-by-table, spending approximately 5-15 minutes per game while also giving everyone at the table a quick chance to practice. Orientation is the process of orientating your dealer to the overall casino rules. 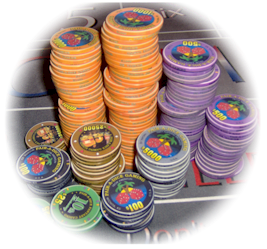 Orientation includes buy-ins, chip placement, normal play, cashing-out and prize facilitation. Please Note: If you order a package of all games without dealers that would be a package where we do not provide the staffing. Additional staffing is available to help meet your needs for your event at an additional cost such as personnel to serve as a runner, teller, attendant, pit boss, additional dealers etc..
What type of Gaming Cheques (Chips) do you offer? We use the absolute best Cheques in the industry, authentic Paulson and Chipco professional gaming cheques. Our chips are fanciful and colorful, edge-spotted, inlaid and come organized (in large chip inventory trays). What if Chips are Lost? The cheques that we provide are VERY costly. In addition we must order a minimum of one thousand chips from our supplier. We will do a simple yet thorough chip count with you 30 minutes before the start of gaming. After the gaming session we will sort and recount all cheques. We encourage you to inform all of your players that we will need all of our chips back, additionally we will make several announcements throughout the gaming session that fabulous prizes are available and to make sure to redeem all chips and funny money. We have found that this method works quite well and normally receive all of our chips back. In the event that any chips are not returned, there will be a $2 charge per each lost chip. There is a $10 charge for each plaque cheque not returned (we cannot get these plaques again- it was a one time limited run on a discontinued design). We do however require players to sign for them to eliminate any lost plaque fees. In the instance that you foresee a large amount of chips not returned, you can minimize the loss by providing us personnel support to monitor players, possibly for each table. In addition, please ask about low cost cheques for sale. We work directly with importers that offer a wide variety of low-cost chips for pennies each. Please inquire for more details. Do you rent just Chips? Yes, $75 per 1000 (for the best in the industry) with Trays. We also rent individual table or personal chip trays. If you rent games from us, they come with the needed chips for that game. If you need additional chips for games we are not providing, yet we are providing some games, the cost is only $50 per 1000. Poker had experienced a half-decade upswing but is now waning (for example, clients are beginning to revert back to poker as another regular walk-up game in the casino lineup with the same chips and opposed to a tournament. Custom Order Note: If we do not have a game in stock that you would like to see, we can get it! Our current layout supplier can design and produce any design imaginable (and we may be able to charge you just the normal rental rate... please ask for details). I did not see what I wanted on your Web Site, what should I do? Contact Us right away - we want you to be a satisfied web surfer! We will upload pictures right away or immediately begin to research your interests- if we don't have it, we will get it! Please Contact Us if you must have smoking at the tables, we have some options available. We do allow food or drink at our tables, however, a cleaning fee may be incurred for food stains or excessive spillage at our discretion. To save you any cleaning charges, we now offer our table tops encased in mylar, so drink and spill and be merry, no damage will result to our tables. Please refrain from food or drinks at non-mylar tables so they still look great for you next time! Do you provide Chairs? If your venue does not provide chairs (most of them provide chairs at no cost-ask us about your particular venue if in doubt) we can provide them on an optional basis. Please see our Party Rentals page. Minimum Eight Chairs per Blackjack, Let it Ride, 3 Card Poker, Red Dog, Mini Baccarat, Pai Gow, Poker 4’, Casino War, Caribbean Stud. Nine Chairs for Poker 6’ game. Thirteen Chairs for Poker 8'. Minimum Ten Chairs or more at your discretion for Bingo game and Prize Facilitation area(s). Placement Note: Chair placement IS included if the chairs are present in the hall at time of delivery. Do you provide Banquet Tables? If your venue has a limited number of tables available, we can provide them. Party Rentals. About 90% of area venues provide tables at no cost, and we will work with your facility contact on tables needed. Two or more 8’ (or three or more 6') banquet-type tables for our chips and cashier area. 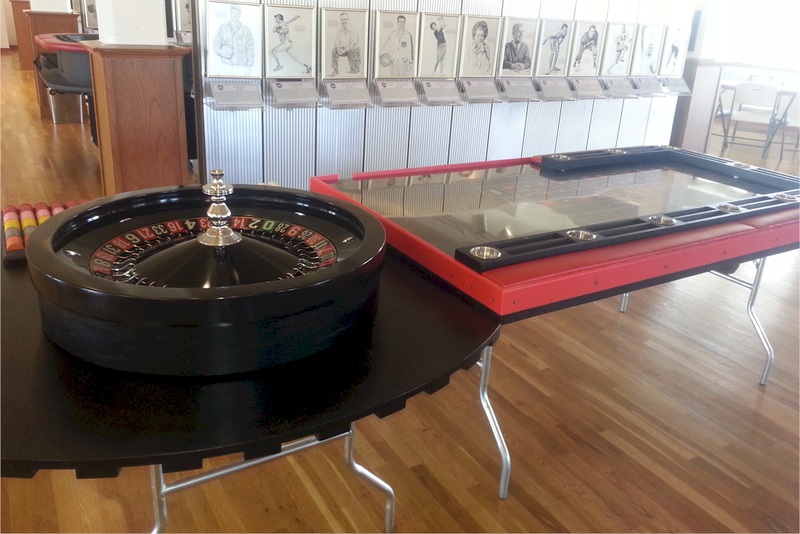 One 6' or 8' banquet-type table for each three or four slot machines. One or two tables for your prizes at your discretion. One table for prize facilitation if required per agreement. 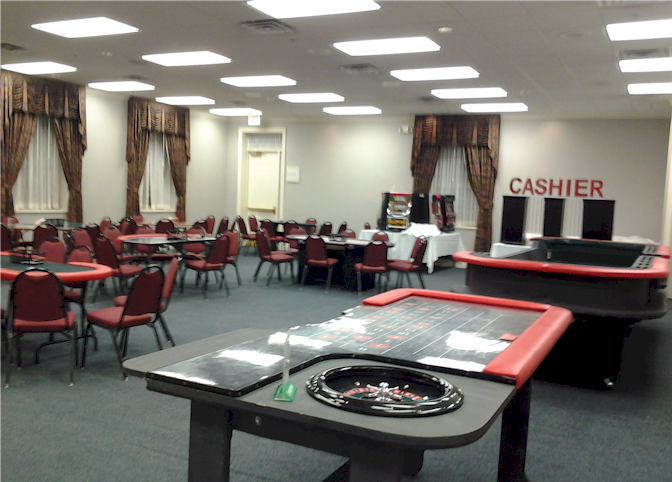 Two 6’ or 8’ Banquet Tables and two 4’+ Tables are needed for Game Show. Placement Note: Table placement and arrangement is included if the tables are present in the hall at time of delivery. Also if we are not providing linens, please make a point to have your tables covered and readied before equipment delivery. If items are to be placed on tables by us, such as slot machines, we will place items on the tables as they are presented unless advance notification is made. Do you provide Decorations? We provide a free Lighted Casino Entryway Sign. For low-cost decorating, we always recommend balloons and metallic wall dressings. Many decorations are available. Please visit our Theme Design page to get started! Do you provide Bar Service? We offer optional Bar Service through Corporate Caterers (same rate as direct). Coming Soon: Fanciful Custom Bar Units with Neon and Armrest. Available with optional Bar Back and in small to long sizes depending on guest total. Please ask for details! Do you provide Music? We offer many optional A/V services through a variety of vendors depending on your needs. Please see DJ's on our entertainment page for DJ info and sound system info. What if there are Damages? Our standard damage policy for our fantasy casino is as follows: Minimum $50 Cleaning Fee for Spillage or Soiling, $50 per hour Shop Fee for damage repair plus cost of materials. Please Contact Us if you have any additional questions not answered, Thank You for your interest in Amerifun!